While not overly wacky, I though it was a good example of some of the books that are out there. This book comes from a publishing company called Shire Books. They publish one of the biggest ranges of specialist history and nostalgia books in the world. You name it, there's a Shire book on the history of that subject. They cover everything from this (above), to egyptology to campervans, tanks, peat, bricks, geese, buttons, gardens, work in the Victorian era, sewing machines, shoes and more! 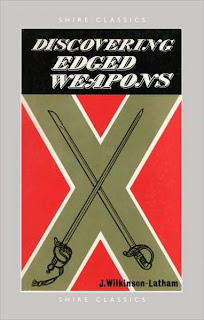 This book traces the development of cutting, thrusting and slashing weapons in all their forms – sword, knife, dagger, arrow, spear, axe, halberd, pike, etc. – from the primitive flints of the Stone Age, through the ancient and medieval periods, to the ornate duelling weapons of the eighteenth century and the elaborate presentation swords of the twentieth century. Also included are sections on the weapons of Japan and of countries where edged weapons have only more recently given way to the gun. Prominence is given to those weapons that are most likely to be encountered in antique shops or even in the attic, and each section is packed with line illustrations and photographs.